This is one of my family’s favorite meals. Both kids and adults gobble it up every time I make it. I love the combo of a savory spice rub combined with a sweet honey glaze. It’s pretty quick and easy too. You don’t have to think ahead about marinating because you’re just throwing together a spice rub. And after the spices have grilled into the chicken, you slather on a honey glaze. Even though it has the word spicy in the title, it’s pretty mild. If you’re worried about the heat then cut the chipotle in half. And if you want to kick things up a notch, throw in extra chipotle chili powder, or add cayenne. 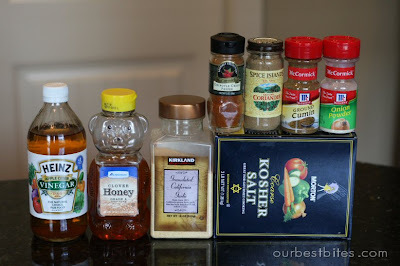 In addition to cider vinegar and honey, you’ll need an assortment of spices: garlic, chipotle chili powder, chili powder (oops, forgot that one in the pic! ), coriander, cumin, onion, and salt. ya right now it’s better with thighs. If you don’t have a bbq, try it on an indoor grill pan or use your broiler. Just be sure to open a window in case you burn your glaze! And my favorite way to eat Spicy Honey Chicken? THIS salad! So my mouth was wattering as I was reading on and on and then to see the picture, sounds sooo good. I bought all the stuff to make today but them remembered that you were going to post the dressing recipe later. Any chance you might do it sooner? My mouth is just wattering. Great site by the way, thanks for all your info. ideas and suggestions. Oh, one more thing, what other recipes would you use the thighs in? Kaylene, I’m posting something on Wednesday that you can use thighs in. Also, you can use them with the Mexican chicken (on the site) to make soft tacos with and they’re soooooooo good. Chicken, soft flour tortillas, a little cheese, some pico de gallo, and some guacamole and it’s seriously one of my favorites. I also really like thighs with Asian dishes, like teriyaki bowls and things like that. Pretty much any grilled recipe, and those can almost always be cooked under the broiler just as effectively. I don’t usually use them in baked recipes, unless it’s something breaded (like a baked “fried” chicken” in which case they actually work well because the extra fat really crisps up the breading. But like kate said, they’re great in Mexican dishes like soft tacos and also on top of salads like in this recipe. 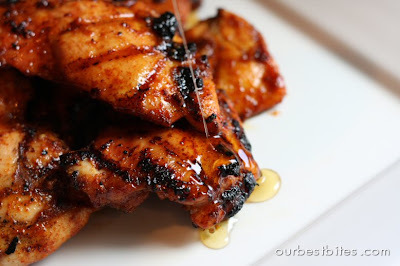 I have a bunch of really great thigh recipes that I’ll be posting in the next few months, like a Asian BBQ chicken, and a honey garlic sesame chicken, so keep checking back! Also, email me at thedailybite@gmail.com and I’ll give you a sneak peak at the dressing recipe! Sara-Is this off that list of recipes you gave me? I’ve used breasts (gasp) and done this on the stove. Probably not as good, but still works. Seriously this chicken rocks. We eat it about every other week. I LOVE IT! Yup Pyper, that’s the one! I made this today and LOVED it! Actually I’ve loved everything I’ve tried so far. Thank you. Okay so I made this, it was super good, should have added more pepper to it because I love spicy. HOWEVER I found the thighs to be too greasy for my liking. Next time I’m going to do breast and pound them out like you suggested. Also, I DID have to broil the chicken cuz we don’t have a grill. I wonder if that would have made a difference but again, just a little too greasy. Vinaigrette was awesome though! Carly, I think grilling thighs does make a big difference. When you cook thighs in the oven they kind of sit in their own juices, whereas the grill lets the fat cook off a little more. My husband said this was his favorite chicken! Thanks! I made this the other day, and it was very yummy! Thanks for the tip on how to broil. The chicken came out wonderfully! Great recipe! My husband said this was one of the best chicken recipes he’d had. Made this for dinner tonight…wow. That is just about the best chicken I have EVER had. Thanks! Our family LOVES this recipe – one thing I added that worked well was candied walnuts one time and candied pecans the next. I can’t decide which one I liked better but it was amazing! I Love this recipe!! I just pulled it out of the oven (ran out of propane) and thisis delicious!! I made this today with chicken breast (sorry Sara), my husband loved it on his salad and my kids enjoyed eating it as is. This may be my new fall back chicken recipe, thanks! Delicious! Great recipe, I’m glad I stumbled across this oldie but goodie. I love your site! this sounds like a great quick weeknight dinner. love the sweet/spicy combination. Love the flavours and looks amazing1 I’m bookmarking this! awesome recipe!! I cant wait to try it! Thanks! Sorry for being thick, but can I check that the T means tablespoons? I’m hoping to make this later on in the week as it looks delicious. I made this tonight and we LOVED it! It was our first try at chicken thighs and they turned out fantastic. Thanks for another great recipe! This was heavenly! So juicy and flavorful. We will make this again and again! Wow – so GREAT! Whole family loved it. I made this the other night and my husband loved it! My neighbor was outside doing yardwork while it was grilling and he said, “seriously, that smells delicious I need that recipe!” I made extra and we had the salad the next day for lunch- yummy! Thanks, love your site! No broiler or grill (wish I did). So, how would you make this on the stove or in the oven? I noticed someone above said they made it on the stove. Angie- no grill or broiler, you poor thing! lol, jk. Ya know, I've never made it this way, but a friend of mine always makes it on the stove top. Just follow the same directions but saute the chicken in a skillet. Throw the glaze on in the last few minutes of cooking and it should still taste really yummy. I'm usually a stickler about using thighs for this recipe, but if you're doing it on the stove top, boneless/skinless breasts might work better for ya. Let us know how it goes! I made this with the salad. My mango wasn't ripe and all I had was a nectarine but it worked out just fine that way. I thought the chicken was even better cold the next day in my salad. Not having a grill seriously impedes my cooking experiences, but it can't be helped at the moment. Thanks for the advice. I'll try it on the stove top in the next week or so and report back the results. I'm back to report my results. The chicken turned out pretty good sans a grill or broiler, but after making them I can now see why they would be much, much better grilled. I coated four boneless, skinless chicken breasts in a little canola oil, rubbed with the seasoning, then sauteed them in a skillet. The last few minutes I added the glaze to the chicken and let them stew for about 5 to 7 minutes. I made the spicy honey chicken salad that you posted May 15, 2009, (my reason for wanting to make the chicken) and it was (and is) delicious! Angie- thanks for coming back with the results! A lot of people have asked what to do without a grill, so that's helpful. Glad you liked it! The hubs and I made this last night and it was great! He keeps telling me how delicious it was. Thanks for a fabulous recipe! It is great both ways, but it is better to have a little sauce at the end. I've been lurking for a few months, but I'm out! Erika O. introduced me to your site and I've been cooking my way through and loving everything! This is one of my new favorites! Unfortunately our grill just met it's death during an YM camp out with my husband. Oh man these were awesome! My husband and 9 year old stepdaughter are a tough crowd and they raved over this recipe. I even went the breast AND thigh route. Oh what we mothers/wives do to keep the peace. 🙂 I agree about the thighs being a must for this recipe. I was just stoked that I had all of the spices on hand already. I did add a smidge of crushed red pepper and paprika. Not sure if it was because I used an indoor grill pan on my stovetop, but I had about 1/4cup of leftover honey glaze. So we just used it to dip our chicken in. I could tell the second I rubbed all those spices on that it was a winner. Winner winner chicken dinner all the way! Okay, I know that I am a little late with posting a comment (seeing as how I just stumbled upon this site)….BUT my family absolutely loved this recipe! They are hooked…. Thank you , thankyou , thank you for making my family smile at dinner time.. This is amazing. My husband and my super picky kids all loved it. My husband actually raved about it. Since it's freezing out, I baked this in the oven and it came out great. Thanks for sharing! Thanks Bethany. But keep in mind it *is* a powder. That particular bottle just has the name of the spice, kind of like ground oregano won't be labeled "Oregano Powder" it will just say "Oregano" ya know? So yes, just look for any ground version of a chipotle chili pepper and that is chipotle chili powder! I made this for dinner last night and it was delicious–as is everything I have made from your site. It was too cold and rainy to grill, so I did them in the broiler for about 7-8 minutes on each side. It was super-easy–I made them while talking on the phone and entertaining my kids! Wondeful looking pictures. I'm not accessing your printer friendly copy. Has anyone tried to season chicken and freeze, thaw and cook later? How does it compare? I don't know why, maybe I'm not used to this type of "heat", but it was way spicy for me. But the honey mellowed it out some, and I enjoyed it. I did use a cast iron grill on my stove top, and it made some serious smoke! I live in an apartment building in South Korea, and I was waiting for the neighbors to call the Fire Department! :) I'll wait to make this again using an outdoor grill when I get back to the states! Hi Jackie, I always season my chicken and freeze it for later use. Tastes the same as freshly seasoned chicken to me, and sooo convenient. I found your website about 6 weeks ago and have made 12 recipes from it. I LOVE It! 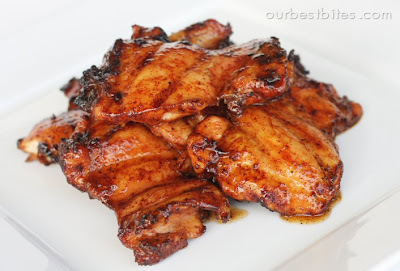 This spicy honey chicken is amazing- my 3 picky eaters and husband who will eat anything really enjoyed this. It is a 5 star for sure! I just bought more chicken thighs to make it again this week! Thank you! Absolutely delicious!! We even made one piece with just the rub (I have one picky eater!) and it was so good we made extra rub to have on hand all the time! The glaze was to die for! Thanks so much!! I made this tonight for dinner. They didn't have thighs so i had to use breasts and wow. I imagine with the thighs its going to be more amazing. What a flavor. I just made the dressing and am going to try the salad. i just made this chicken and it was soooo delicious! the honey glaze was just perfect with the spicyness of the rub. i almost made it too spicy! i will definitely be making this again! thanks! i just discovered this website, and i love it! Wow, I made the chicken for dinner last night and it was delicious! The combination of spicy and sweet was just perfect. I went ahead and made the salad dressing last night and had the leftover chicken in the salad for lunch today and it was even better if that is possible! The dressing was to die for…way better than any restaurant salad I have ever had. Thanks girls and keep it up! Last time i made this (quite a while ago)…i was still able to see the old recipe. I have since made it with the new recipe, but my husband prefers it the other way. Do you mind sharing the old recipe again? I should add, I served it with a mango salsa. It rocked it out of the park!! This is a "staple recipe" in our house now! Oh my this.is.so.good. First time I used my indoor grill, good, not great, open flame is the way to go. DH ate 1.5 for dinner & snuck in for a mid night snack & ate 2 more! Yum! Made this for dinner last night, and it was sooo good. I'd never made chicken thighs before and you're right…definitley my new favorite thing. I wish I'd made more so I could have more leftovers! Made this for dinner recently on the indoor grill (messy but sooooo worth it)-my husband said it was the best chicken he has ever had. Sweet, spicy, thighs? Check, check, check. All his faves. This made history at our house and I didn't even make leftovers. We'll be making it a lot, I'm sure. Hi from Malaysia! I came across your site after googling for recipes and have been coming here for more since! I've tried the mini key lime tarts, bacon-wrapped sausages and the mini cheesecake tarts.…all to great satisfaction! Thanks for sharing all your wonderful recipes! I've been wanting to try this recipe since I came across it but after looking through some supermarkets for the rub I can't seem to find the chipotle chilli powder 🙁 all I did manage to find was chipotle chilli in adobo sauce(which I did get just in case!). Could I substitute the canned chipotle chillies for the powder and if so, how much should I put in? There's also another question which might sound dumb. As I was looking for the ground coriander, all I could find were either 'Ground Coriander Seeds' or coriander leaves that were dried and looked flaky. After looking at your photo the spice looked like the seeds one but just to be sure, is it really coriander seeds? Sorry for the lengthy questions! For the coriander, you want a ground powder. So if it says "ground coriander seeds" then that's correct. Avoid whole seeds. Thanks for the quick reply, Sara! Yup, that definitely answered my questions 🙂 I will be making it today for my mom…thanks for letting me know about the canned chipotle chillies recipes! I'll definitely try those out next 🙂 Keep up the great job! Your site is awesome! Made this for the first time yesterday for our Mother's Day BBQ. Everyone loved it! It was delicious! My husband had bought chicken breasts, so that's what we used. Still great! I also made the Brazilian Lemonade for the BBQ. Another hit! Hi from Ghana! I stumbled across this recipe some time ago and finally got around to making it this weekend. Living in Ghana, I'm a bit limited by the ingredients that are available and affordable here but I love experimenting! I found most of the ingredients needed for this (a few substitutions) and it was a huge success! We were stealing pieces from the fridge all night. We had it for lunch with in a DELICIOUS salad and I still have a TON of Spicy Honey Chicken leftover. Any other serving suggestions? Thanks so much for the awesome recipe! Love your blog! I made this for father's day yesterday and it received RAVE reviews!! Thankyou so much for all this deliciousness. made this for dinner tonight and it was a huge hit! I was hoping there would be a couple of pieces left over for lunch tomorrow, but no such luck! thighs are definatley the way to go! I made this yesterday and it turned out really good! I have an indoor grill (yay for apt. living.. blah!) and had no problems with it. My husband doesn't love "saucy" wings or chicken so he was hesitant at first, but loved it! I didn't know what to cook on the side so I just made some loaded mash potatoes. Worked great together! Thanks for the recipe ladies! I just came across your website a couple of days ago. I already have a huge list of recipes I want to try. Tonight I made this recipe. It was delicious! Keep the yummy recipes coming! Hi from Germany!! I am hoping to try this recipe this week – it looks fabulous. What would you recommend serving as a side dish with this chicken? I saw you posted a salad with it, but since it's getting colder, I'd like to try something warm. Basmati rice maybe?? Thanks! Franzi- yes, rice would be wonderful! I just made these and served them with black bean and jack cheese quesadillas… I made the chicken with breast meat (it's all I had) and it was outstanding! Thank you for the recipe! This was the first recipe I found at Our Best Bites and it is absolutely fabulous. I am a chicken-cooking phobic person, always afraid I am not getting it done and the other problem is I never or hardly ever like what I cook like when you make a salad at home and it never tastes as good as it does in the restaurant. This is the recipe that made me feel like I was eating restaurant quality food. From the bottom of my heart, thank you, thank you!!! I have also made your apple streusel and I cannot leave it alone. Thank you for making recipes that dont require gourmet ingredients. You gals rock!!!! I made this for the first time tonight. My hubby saw me at the grill and he was excited to see what I was cooking up, he was a little disappointed to see it was chicken–that is until he sunk his teeth into it!! My whole family, kids 7,5,2, and baby all loved it!! My son had a pile of bones on his plate. We had no leftovers to speak of and I was looking forward to fixing the salad!! Shucks. Guess I will have to double it next time!! Thanks! Great recipe! The rub is fantastic!!! I did have to cut down the chipotle for my non-spicy-loving family *sigh*. Even without all the heat – it was great though! Super with corn on the cob. Forgot to say, I used skinless, bone-in breasts and drumsticks. Thanks again for all of your wonderful recipes!! I made this chicken, with the salad walker this week, using chicken tenders, I loved it so much that I’m having the chicken again tonight!! The tenders worked just fine… And i had a huge bag from costco, so thats what I’m using again tonight! WOW, I think this is my new favorite chicken recipe. EASY and company perfect. I did not have chipotle chili powder so I used smoked paprika. My kids gobbled it right up! OMG! This was THE best!!! We currently don’t have a grill, so I used our indoor grill pan! We had it with “smashed” potatoes (I used butter and Philadelphia’s Garlic Cooking Creme), and Steamed Broccoli, with Honey Wheat Hawaiian Rolls! This meal is a KEEPER! Tyler (my hubby) says, “Great pairing, all the sides go well with the chicken!” YUMMY indeed! We will be making this again! Slightly embarrassing, but it sure tells you how good this was! I’ll definitely be coming back here often! We made this last night for dinner for the first time and it was BLOW MY MIND fantastic! My two and a half year old even gobbled it all up! I am making this tonight. I though it was funny I have the EXACT same brands for spices. Down to the Kirkland garlic:) LOL! What a great, easy dinner! Loved the salad and homemade dressing on the side too. Can you tell me where you can buy the granulated garlic and chipotle chili powder? I can not find it anywhere. granulated garlic is just garlic powder (it’s technically a coarser substance but either works) and you’ll just have to check the grocery stores for the chipotle powder. Most well stocked stores should have both. This was so delicious! I cut out the chipotle completely (gringo tongues around here), but it was still amazing! This was so good. I took a big zipper bag of these thighs to my sister’s for her 4th of July BBQ and they were a hit. Her kids are picky eaters and they loved them. After we left her oldest asked if there were any left. He wanted some for an evening snack. Before I left her house I gave her the recipe I had brought along with the chicken. Today I took an empty seasoning jar with a shaker; took the lable off and filled it with just the rub, so I’ll have it on hand when we make this again. Thinking of making my sister a jar too as a gift. This is my first time trying one of your recipes. (And first time commenting.) I LOVED this chicken. I just made it last night. SO good. Perfect combo of spicy and sweet. 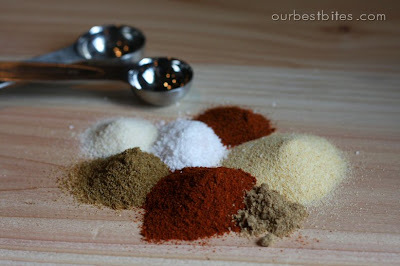 If I make it for my kiddos I will cut back on the spice just a bit (probably half both the chili powders). Thank you! I was getting bored with my go-to chicken dishes. And I broiled the thighs and it was great. I made this for dinner last night and we loved it!! The salad and everything, it was sooo delicous! After drooling over the picture for a few days I finally got around to making this. So good! My husband who usually hates chicken liked it. Even my kids ate it up. I can’t wait to make it again! I didn’t find it too spicy and I will probably add a litte more chipotle chili powder next time. Since you are a culinary genius, would you mind suggesting a great side dish for this chicken? I love it in the salad but I am serving this to some meat and potatoes type of people who might sneer at a salad for dinner. Thanks! I love it with coconut rice, or the lime-cilantro rice! This is an amazing recipe. I love the flavors in the chicken. I must say, this was my first time buying chicken thighs and they are a little too fatty for me. I like the fact that they are thinner than a chicken breast so you get more flavor so I think next time I will try a chicken cutlet (a chicken breast sliced in half to make it thinner) so you still get a lot of flavor and not as much fat. If granulated garlic is just garlic powder, could you just put garlic powder in the recipe? I am sur I wasn’t the only one who had never heard of granulated garlic. I served this with coconut rice, as you suggested in your cookbook and both dishes knocked the socks off of our guests. Thanks! Made this tonight for dinner and it was amazing!! Everyone devoured it:) Will make this again. Thank you!! Yum yum yum!! Delish! I didn’t have the chipotle chili powder so I added some chipotle Tabasco to the rub and it was great! I served it with some steamed green beans with butter and cilatro and a squeeze of lime over the chicken.. I don’t even have the words to describe how much my husband and I enjoyed this! I love all of your recipes- so much that I’ve almost quit my day job to become a chef. 🙂 They make me love to cook even more because I always know that my food will taste amazing! I was so excited to try this recipe! I bought the thighs even though I have never used them.. The chicken was good but I could only taste the coriander and I can say I am not a huge fan! I will make this again and omit the coriander all together.. Other than that.. The glaze was Delish!!!!! Hey Sara there is no doubt its a super awesome stuff but i dont have a bbq or grill can i still cook it on a normal gas with a pan on it. Yes, or even better yet, use your broiler. Best chicken I’ve ever made. Made my self stop eating it so I could take some for lunch tomorrow. What an amazing recipe. I disobeyed. I first tried this recipe last year with chicken breasts…on kabobs. It was great! BUT then I tried this recipe verbatim last night. I confess my sins of recipe disobedience because it was the bomb diggity with the thighs. I am not a lover of dark mean poultry but seriously, this recipe is the very best following your recipe exactly. We just gobbled it up even my 4 & 2 year olds ate every bite! I served it with your brazilian cheese muffins and a green salad and it was sooooooo good! Perfect summer meal! I made the chicken night before last. I didn’t have any chipotle powder, so I added 1 tsp of chile in adobo sauce to the oil to rub on the chicken. It came out delicious. Since there are just two of us, I decided to use the leftover chicken for the Spicy Honey Chicken Salad. I made the dressing yesterday before work, so the flavors would blend. Enjoyed the salad last night as a main course. It was lovely! The combination of the spicy dressing and the sweet mango was wonderful. This is going into my permanent file. It’s a perfect recipe to have for weekend guests, because you can barbecue once, and have two nice meals. We have to try this recipe asap! It looks so yummy. Thanks so much for your tasty recipes! I made this tonight and my family loved it! I have made so many things and my family (not usually easily impressed) has fun picking out what we will try each week. We are planning a night at church to demo and sample a lot of your recipes. I have purchased about a dozen of your cookbooks to give as gifts. Thanks for inspiring me to cook again! Made this tonight, but had to make some changes. My gas grill (I know, I know) is out of propane, so I did these on the stove. I was worried about the smoke factor, so I cut my chicken into bite size pieces and sauteed in a pan with just a touch of the honey/vinegar combo. When the chicken was almost done, I poured in the rest. An unfortunate effect of cooking it this way is you don’t get the gorgeous caramelization like you would on a grill. Grill next time fo sho. I served it over white rice and it is SO good. Thanks for the recipe! Think I will head into town tomorrow and exchange my propane tank! I saw this recipe online and didnt have any of the ingredient but salt so I ran to the store and got them all! It just came out of the oven (my first time ever broiling! since i have no grill) and It looks AMAZING! I am serving with southwest rice and I can not wait to try it! I will be making this again if it tastes anything like it smells and looks! Thanks!! Tried this recipe tonight since I had all the ingredients :)! Family loved it and said they want it again soon! Thanks! So good I nearly cried! I used breasts and did it in the broiler since my grill was broken. HEAVEN!!! what temp and for how long would you cook it in the oven? I must say, i CRAVE This chicken. I had it for the first time oh, 3 weeks ago, and we’ve had it EVERY WEEK since. It’s seriously *THE* best chicken i’ve EVER had. Thank you so much for saying you used tenders! I’m making this with tenders tonight. My family will not eat dark meat chicken. wow that was so good. I’m an expat and where I live it’s impossible to find things that approximate real American barbecue-style sauce, dry rubs, and the like. I broiled it and it was fantastic! Thanks for such a delicious recipe. I’ll be making this again & again. I just made this for me and my boyfriend and we LOVE it! Goes perfectly on a bed of jasmine rice. The only difference was I made mine with chicken tenderloins and I cooked them in an electric skillet with some extra olive oil. Had to make do! It was still a wonderful recipe and I can’t wait to grill the chicken next time and to make it with the mango dressing. My house smells amazing after cooking this! This recipe is amazing. I mean heart-stoppingly so. I do the cooking in our family, and my wife and kids loved it! Best recipe I’ve tried so far, and that’s saying something because I make something from your site almost every day. I have loved everything! i love this recipe, but don’t have a grill as well. i’ve read through the comments and don’t think anyone’s asked this yet…f i use my broiler in my oven. how long should the thighs cook? do I flip them? I’m always scared i’m not going to cook chicken right. with no grill, should i skip this recipe and try one of your other brilliant ones or would you give it a go still in the oven broiler settinG? I’d place them a rack down from the top and don’t glaze them until the very, very end or the sugar will burn. Cook them until both sides are golden brown and then time them by internal temperature. Hope that helps! Do you happen to have nutritional information for this recipe? Calories specifically. Thanks!!! Love the chicken!! I just had to tell you that when I served this up tonight for dinner, my 5 year old declared, “This is delicious!” I couldn’t believe what I was hearing. This came out of the mouth of my child that somehow survives on peanut butter and angels tears. I am going to make these for our labor day BBQ. thanks for another great recipe. These are delicious ! I made this using chicken breasts and 2 Tablespoons of BBQ sauce. My boyfriend loved it too… big plus. This recipe will definitely be used often! was looking for a good chicken wing recipe, but found this! i’m gonna try it on the wings, baked in the oven. wish me luck! it was great but i don’t think 3-5 min. on each side is long enough to cook the chicken thoroughly. i looked it up and at least 25-30 min. was the average time recommended. am i missing something here?……. did you mean 13-15 min on each side?………..i loved it but i did cook it 35 min. It just depends on the size of your chicken thighs, the best way to be sure is just to cook it to temperature. Cooking times will vary according to a lot of variables. this is by far the best chicken recipe I have ever made, I trade the chipotle chili pepper and the regular chili pepper (2t chipotle, 1/2t regular) and it is super spicy and amazing. I also make this with a rice dish I either made up or found somewhere and I drizzle the honey glaze over the chicken and the rice. I make this at least once every other week. Also I use chicken breasts, bake it and put the glaze on at the end and it’s super delicious. Hello….how long do you bake the chicken for?! Hey Sara saw the recipe and loved it. Just wanted to know if it can be served cold with the salad and if so will it have the same taste? when choosing to broil it, do you place the glazed chicken on the rack or would it be acceptable to use foil or something? Yep, you could put it on foil, or a rack and just turn it half way through. Enjoy! So i just came across this…don’t know how I missed it and planned on making it this week. One thing though…how important is the chipotle chili powder? I can’t find it anywhere! I could just use more regular chili powder? Hey there, I was just wondering if you had any suggestions on what to serve this with?? I am totally bored with the whole chicken and rice/roasted vegeteables thing so I was just wondreing if you had any creative suggestions???? I just made this chicken last night! Rave reviews all around. The chipotle powder made the skin a little too spicy for my 9-year-old, and we had to broil it because we had some bad weather, so it looked burnt, BUT, thankfully, did not taste that way. All in all, we were all impressed, and I will be making this chicken again. I am writing about the chicken today on my own blog, and plan on giving you a shout-out. This is a heads-up to let you know that you will, hopefully, be getting a little more chatter coming your direction. Thanks for a fantastic recipe. I can’t wait to make it on the grill!! We also modified and did it in the oven since our grill is dead. We baked them in a Pyrex covered in foil to keep the moisture in, then took the foil off and broiled for a few minutes on each side to crisp them up. Amazing. Being added to the regular meal rotation. We stumbled upon your site and think we are going to have to make this recipe as it sounds delicious!!! We are going to try it on chicken wings instead of thighs or breasts as we are in the process of reviewing various recipes on the internet for wings. We will post a full review once we are done http://wingsaucereview.com and provide a link back !! I just found this site and this recipe sounds great. I’ve been making something very similar for quite a while with a similar spice blend but instead of honey for the glaze I mix some peach jam with a can of chipotle chiles in adobo (we like it kinda spicy and actually add more heat to it) but we pulse it in the blender for a few seconds or sometimes just warm it up a bit on the stove. I reserve the leftover glaze in the jam container and it will make 2-3 meals. Sometimes my husband likes the warm glaze to dip the chicken into. I will have to try it with honey and vinegar. It sounds right up our alley! *happy sigh* This stuff is so good. Had a pkg. og boneless, skinless chicken thighs, and found this recipe, so I thought I would try it. Followed your recipe exactly, and it was delicious! Hubby & I like spicey, so I added more chipotle and some cayenne as you suggested… great recipe, and will keep this for future grillin’, for sure… thank you for sharing this with us! sorry for the misspell… Had a pkg. “of”, not “og” . We are a family who can’t handle spicy, and my daughter really dislikes honey, so I stayed clear of this recipe. It was a huge mistake! My sister made it and I tried a piece of her left overs. When we got back from out of town i made it for our Family, (no changes, it was a bit spicy before i put the extra glaze on top but great after) Everyone loved it! My daughter who dislikes honey had seconds and then thirds! Thanks for another keeper! In the recipe it calls for Cider Vinegar but in the picture the bottle reads Apple Cider vinegar. Can I use either? Could I use agave nectar instead of honey? Our family loves this chicken! We LOVE this chicken! I usually make it with the salad, but any ideas for sides to turn this into a fall meal?